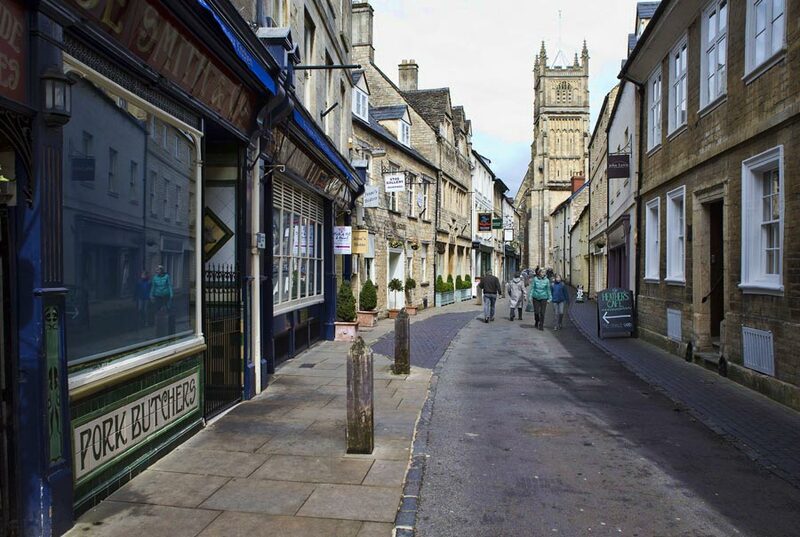 Cirencester is a lively market town, the largest in the Cotswold district, and hence often referred to as 'The Capital of the Cotswolds'. The town, which has easy access to London trains and is within an hour's drive of both Heathrow and Bristol airports, has a rich and well-preserved historical heritage that makes it an excellent starting point for first-time visitors to the Cotswolds. Cirencester lies on the River Churn, a tributary of the Thames, which, in fact, rises just a few miles to the west. The earliest known reference to the town is in the writings of Ptolemy, a Greek author who mentions 'Korinion' in his 'Geography', which dates from around 150 AD. But it is the Romans who really put Cirencester on the historical map. 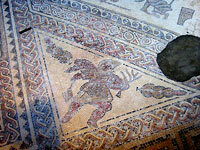 Corinium Dobonnorum was the second largest Roman town in Britain, after Londinium. Many Roman remains have been excavated in the surrounding area, including the National Trust owned Chedworth Roman Villa, which is the best site in the country for exploring and understanding the remains of a large country house of the Roman period. A Roman Ampitheatre still exists on Cotswold Avenue to the south-west of the town, although it has only been partially excavated, while the newly re-vamped Corinium Museum, in the centre, is one of the finest collections of antiquities from Roman Britain that exists anywhere. Spread over two floors, the museum houses mosaics, tombstones and sculptures together with reconstructions of a Roman kitchen, garden and dining room that include hands-on exhibits and interactive displays. Although the museum is particularly famous for its Roman collection, it contains exhibits that detail the story of the Cotswolds from pre-history right up to the late 19th century. A new Anglo-Saxon gallery was built to house the remains found in a cemetery in Lechlade that was excavated in 1985. The remains include rare gold pendants and other artefacts but perhaps the most arresting exhibits are the forensically re-constructed man and child who were among the 219 bodies found. The gallery is also home to Mrs Getty, a 6th century princess who was also found in the cemetery, so called because of the 500 treasures that were buried with her. The re-vamped medieval gallery, meanwhile, concentrates on the legacy of the wool trade and in particular its impact on Cirencester's Abbey. The Abbey was the second largest Augustinian foundation in the country until it was almost entirely destroyed during the dissolution of the monasteries under Henry VIII. Only the Norman arch and parts of the precinct wall remain. A country house was built on the site of the former Cirencester Abbey, which was granted to Richard Master, physician to the Queen Elizabeth I, in 1564. The family still own the agricultural estate, although the house was demolished in 1964. Today the site has been turned into what is known as the Abbey Grounds, whose perimeter is defined by what remains of the old precinct wall. The Grounds, just to the north of the parish church of St John the Baptist, right in the centre of Cirencester, offer a peaceful break from the bustling town. The grounds conatin a bandstand, used regularly in summer and the Abbey Lake, which has its own angling club. 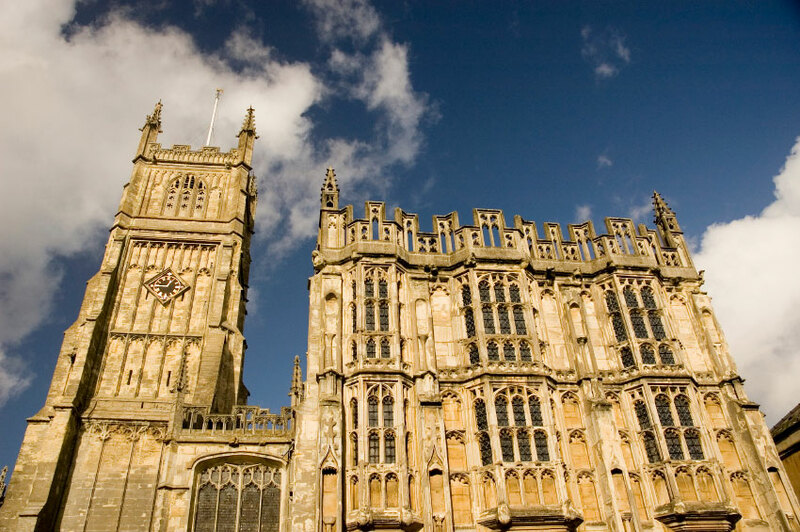 The Church of St John the Baptist is thought by many to be the grandest of all the Cotswold wool churches and has often been called the 'Cathedral of the Cotswolds'. The church's 120 foot tower dominates the town and its unique three-storey porch was used as the town hall until the late 19th century. The church is also the proud resting place of the Anne Boyleyn Cup, which was made for the second wife of Henry VIII in 1535, just one year before she was executed for adultery. The cup was given to the church by Richard Master. Today's Cirencester has a thriving crafts scene, the centre of which is the Brewery Arts House, a converted Victorian brewery with sixteen resident craftworkers including a jeweller, a basketmaker, a ceramicist, a textile weaver and a stained glass artist. The Arts and Crafts movement flourished in the town under the patronage of the Bathurst family, who moved to Cirencester House, to the west of the town, in 1714. The first Earl of Bathurst laid out what is now one of the finest landscape gardens in England at Cirencester House. The town is also home to the Royal Agricultural College, a striking Victorian Gothic style building designed by Samuel Whitfield Daukes. Established in 1844 it was the first such college in the English speaking world. The college is located next to Cirencester House and the Earl of Bathurst was one of the first chancellors. As would be expected courses in agricultural sciences, equine studies, rural land management and international rural sustainability are offered along with some more business oriented ones. Looking through a list of the Royal Agricultural College's alumni one cannot help but notice the number of titled graduates inluding earls, viscounts and dukes, not to mention one or 2 princes.